Ian Page and Classical Opera kicked off their mammoth Mozart 250 celebration which for now until 2041 will be exploring the music of Mozart year by year, 250 years after he wrote it. The festival started this year with the seven year old composer visiting London. As Mozart wasn't writing operas (though it would only be a few years before he did), the main work for the launch was an opera which was premiered in London during Mozart's visit, by a composer that Mozart revered, JC Bach. JC Bach's Adriano in Siria, setting a libretto by Metastasio, was premiered in London at the Kings Theatre in 1765. Classical Opera is giving the work's probably modern premiere at the Britten Theatre at the Royal College of Music this week. We caught the second performance, on Thursday 16 April 2015, in a production directed by Thomas Guthrie and designed by Rhys Jarman with lighting by Katharine Williams. Rowan Hellier played Adriano, with Stuart Jackson as Osroa, Ellie Laugharne as Emirena, Erica Eloff as Farnaspe, Filipa van Eck as Sabina, Nick Pritchard as Aquilo. Ian Page conducted the orchestra of Classical Opera. The libretto by Metastasio had been originally written for a setting by Caldara in 1732 in Vienna, but would go on to achieve great popularity and JC Bach's setting was preceded by 40 more that we know about. The libretto was adjusted for London, and anyone who knows Handel's later operas will recognise the principles with a drastic reduction in the amount of recitative, a re-balancing against recitative in favour of arias and a tendency to prune sub-plots to the point of nonsense. Plot-wise, JC Bach's opera had a number of glaring gaps and it was almost a 'highlights' opera. Classical Opera performed a version with around 2 hours of music and had only omitted a couple of minor arias and made small cuts to the recitative. I imagine that Hasse's 1752 setting lasted far longer. Hasse was famous for being true to his friend Metastasio's libretti and setting the full recitative uncut, whereas JC Bach seems to have had more modern impulse. The fascination of listening and seeing the opera is knowing that it had a significant impact on Mozart, and being able to hear it. Whilst structurally we are still in the world of Handelian opera seria, aurally things have moved on. JC Bach's music often sounds, to our ears, like early Mozart (and one of the great things about Classical Opera's Mozart 250 project will be to make us realise how often we get this wrong and that it is Mozart who sounds like, yet develops on, his predecessors). JC Bach might have stuck to the basic opera seria structures but he was not above making adjustments. Some of the arias do not have proper Da Capo sections, the repeat of the A section is abbreviated. The composer introduced a duet and a trio (shades of Mozart again) and was clearly more interested in the emotional content of the arias than anything else. The final scenes of the opera are simply mad, there is a very long and emotional aria for the hero Farnaspe in prison and condemned, then suddenly we are in the final scene tidying things up. JC Bach's heart was clearly in the aria! And where he scores above a composer like Hasse is that JC Bach's arias seem to have emotional content. Yes, he could write showy ones, but there are poignant slow ones too with some lovely heart-wrenching moments. Director Thomas Guthrie took the admirable decision to play it straight. 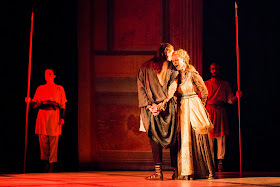 Rhys Jarman's costumes were based on togas for the Roman men and tunics for the Parthians. The settings cleverly evoked the Roman world and I particularly loved the way the outdoor scenes used cut-out in black against the lit cyclorama (very effective when the back lighting turned red as the distant capitol burned). Thomas Guthrie and his cast played the drama straight, and made it work; taking the piece seriously and not attempting to put too modern a spin on it. If Thomas Guthrie's production had any pensees at all it was his fondness for supers, who moved around the stage a lot. His production style seemed to derive its ethos from the productions of Katie Mitchell with their detailed back story and busy goings on as a back drop. Luckily Thomas Guthrie knew when to stop and for some key moments we had a sense of calm on the stage as JC Bach's music unfolded. And rarely did I get the sense of the director fussing over the production, anxious to keep the interest up during a long Da Capo aria, you felt Thomas Guthrie and his cast trusted the music. The opera calls for a superb group of singers; JC Bach might write long lyrical melodies, but his soloists expected a chance to show off too. 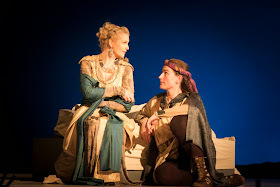 The title role, as was often the case, was not the prim'uomo this was in fact the Parthian prince Farnaspe (Erica Eloff), in love with Emirena (Ellie Laugharne) who loved him in return. Unfortunately Emirena's father, Osroa (Stuart Jackson) was the defeated King of the Parthians and she had come to the attention of the Roman Emperor, Adriano (Rowan Hellier) who had decided to pay her court and abandon his Roman financee Sabina (Filipa van Eck). All was made more complex by a scheming courtier, Aquilo (Nick Pritchard). 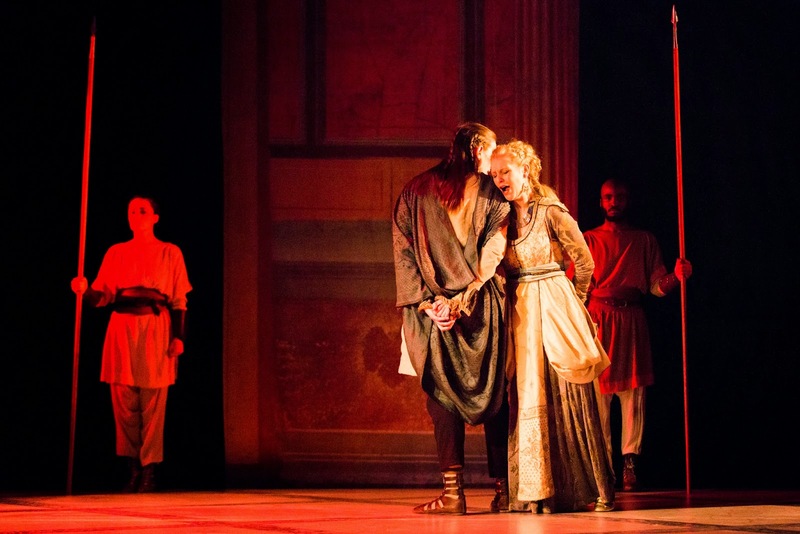 Thomas Guthrie's direction, and Rhys Jarman's costumes meant that from the beginning we knew who was whom and Romans and Parthians were nicely differentiated visually. Erica Eloff as Farnaspe got to show off her bravura fireworks in her opening aria, but it was in Farnaspe's two long serious arias that Erica Eloff really impressed. In act two Farnaspe insists on pausing during the flight from the palace to sing a long thoughtful aria to Emirena, and Erica Eloff brought a real sense of calm and line to this. Then in act three there was the prison aria that I mentioned earlier, a very long, very powerful piece which Erica Eloff invested in much emotional weight and beauty of line. Ellie Laugharne had a similar journey to go on as Emirena, varying from alarming joy at being reunited with Farnaspe (cue some crazy virtuoso bravura) to a gentle lyric aria as she waits for him and a poignant duet as the two are re-united (yet captured). Laugharne impressed in the way she coped with the bravura with poise and yet had the beauty of tone and sense of phrasing to bring the more lyrical, Mozartian moments off too. She and Erica Eloff made a really moving pair in the duet, and then at the end of act three they were joined by Emirena's father Oroaspe (Stuart Jackson) for a really powerful trio. This was one of those pieces where you could really feel the tide of operatic style flowing, from Handel to Mozart and beyond. The character of Oroaspe was one whose role probably changed a lot with the trimming of the libretto. As the number of arias was reduced, the balance between Oroaspe and Farnaspe was altered, so Oroaspe's role became more prominent. But Oroaspe is a monomanic, there is no character development; throughout the whole opera he is intent on one thing, revenge on Adriano for his defeat. Tenor Stuart Jackson coped well with this limited palate, and gave a series of impressive performances of Oroaspe's arias, with their challenging high tessitura. Stuart Jackson has a narrow, focussed lyric voice with a bit of heft to it which would seem idea for this repertoire. As an actor he seemed a little stiff, but then again he did not have much to work with and made the most of the fact that he is a big bloke with an impressive stage presence. The second couple were Adriano (Rowan Hillier) and Filipa van Eck (Sabina). Whilst Rowan Hillier got a bravura opening aria and one or two others, which varied the mood it was only with Adriano's final aria when he comes to his senses that we sensed the character's full potential and you felt that it was only in the last act that Rowan Hillier was able to give a real sense of Adriano's character. Filipa van Eck similarly impressed despite the limited range alloted her character, and she gave a series of thrilling bravura performances. Filip van Eck's voice has an interesting steely firmness which combined with her ability with the busy passagework, gave her performance a dramatic thrill. Tenor Nick Pritchard sang the role of Aquilo. In Metastasio's original Aquilo seems to have been something of a schemer, but here we only got vestiges but Nick Pritchard made the role dramatically coherent and was very involving in the single aria he was allotted. The small orchestra of 23 players made a fine and lithe sound. JC Bach's orchestral writing was very lyrically based (long melodic lines with simple accompaniments) and he took advantage of the presence of clarinets and horns in his orchestra, and we had some lovely solo moments. There were one or two moments when I suspect that the orchestral ensemble did not quite achieve the degree of suaveness that Ian Page may have wanted, but overall they impressed greatly. Being able to experience this opera in the theatre was a great boon, it makes such a difference. JC Bach's operas are slowly being discovered but there is a world of difference between listening to them on CD and sitting in a theatre and finding out how the music works as drama. Whatever my caveats about the work itself, I have to commend Classical Opera for its daring and to say that they, and JC Bach did give us some sublime moments. Classical Opera's Mozart 250 project continues, and in January 2016 they will be exploring the music of the year 1766 at the Wigmore Hall. If you are interested in other settings of the same libretto, then Opera Settecento is performing Pergolesi's 1734 setting of Metastasio's libretto at Cadogan Hall on 16 September.